“According to Murdoch, the majority of the people just do not understand the SS-20 threat. He asked if we could release satellite photographs of Soviet SS-20s to dramatically stem the rising opposition to GLCM [U.S. ground-launched cruise missiles] and Pershing II deployment. He felt that the delineation of the SS-20 threat graphically could be very persuasive. It would give the press – the friendly press in particular – an opportunity to counter the growing wave of unilateralism. The next section of Wick’s letter remains classified – more than three decades later – on national security grounds. Cohn’s high-profile role in the McCarthy hearings ultimately ended when he was forced to resign over charges that he targeted the U.S. Army for an anti-communist purge because it had refused to give preferential treatment to one of his close associates, G. David Shine. Though Cohn denied he was romantically involved with Shine – and a homosexual relationship was never proven – Cohn’s own homosexuality became publicly known after he underwent treatment for AIDS in the 1980s, leading to his death in 1986. However, in Cohn’s final years, he enjoyed close personal ties to the Reagan administration and exchanged warm notes with Reagan himself. 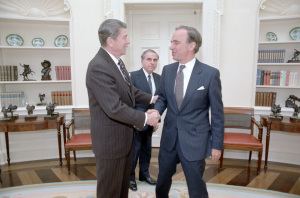 But, more significantly, Cohn, as one of Murdoch’s lawyers, brought the influential publisher into the Oval Office on Jan. 18, 1983, to meet with Reagan and Wick. A photograph of that meeting – also released by the Reagan library – shows Cohn leaning forward, speaking to Reagan who is seated next to Murdoch. By late 1982, the Reagan administration was gearing up for an expanded propaganda push in support of the President’s aggressive policies in Central America, including support for the Salvadoran and Guatemalan militaries – both notorious for their human rights violations – and for the Nicaraguan Contra rebels who also were gaining an unsavory reputation for acts of terrorism and brutality. As the White House continued to cultivate its ties to Murdoch, Reagan held a second Oval Office meeting with the publisher — on July 7, 1983 — who was accompanied by Charles Douglas-Home, the editor of Murdoch’s flagship UK newspaper, the London Times. “What surprised everyone about it – not just me – was quite how close it was and the informality of it,” Richards said, confirming what had been widely reported regarding Murdoch’s access to powerful British politicians dating back at least to the reign of Prime Minister Thatcher in the 1980s. The Reagan documents suggest that Murdoch built similarly close ties to leading U.S. politicians in the same era. These glimpses behind the curtain also reveal how these symbiotic – or some might say incestuous – relationships have developed between media magnates and likeminded politicians. Though Murdoch might argue that he was simply following his ideological beliefs – and putting his news outlets behind his political goals – it’s also clear that his commitment to right-wing causes proved very profitable as well.